Parker’s monoflange significantly reduces the number of potential leak paths by combining customer-specified valves into a single manifold valve. The monoflanges also have a lower system mass, which reduces loading and vibration stresses, further improving safety and reliability. 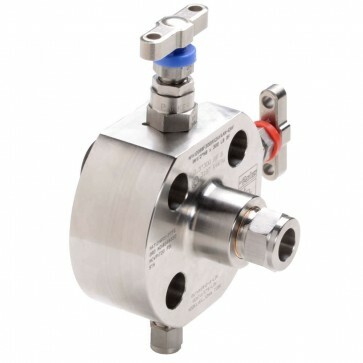 The Parker Monoflange has needle valve primary and secondary rather than ball valves. The monoflange is preferred by some operators as it is smaller than a traditonal double block and bleed valve, giving even more space and weight advantages. This ensures that the monoflange is it is a cost efficient option for owner / operators. The monoflange allows the mounting options to suit whether the pipeline is vertical or horizontal, the gauge or pressure transmitter can be fitted on either the front face or on the outer diameter of the body to allow good orientation and ease of reading. Parker’s monoflange is available in a wide range of single-, two- and three-valve configurations, including block, double-block, block-and-bleed, double-block-and-bleed and block-bleed-block. Standard flange sizes include 1/2", 3/4", 1”, 1-1/2” and 2”, together with API and DIN standard versions, and there is a extensive choice of flange classes, from ANSI 150 to 2500. Standard outlet vents are 1/2" female NPT. Depending on monoflange size and configuration, other options include 1/4", 3/8”, 6 mm, 10 mm and 12 mm sizes, and male NPT or Parker inverted A-LOK™ double ferrule compression fittings.